The post LOOK: This Skin Treatment Can Help You Look and Feel Younger appeared first on When In Manila. Do you look your age? Do you want to look younger? Well, we’ve got good news because we discovered a non-surgicial skin treatment at Aramesh Wellness that will make you feel younger. Called High Intensity Focused Ultrasound, this treatment targets various depths of the body’s tissue for skin tightening and skin lifting. It basically works as a non-invasive facelift that targets the ‘V’ line formation and jowl lines. Aside from tightening the skin, it also works at ironing out wrinkles and shrinking pores. Aramesh HIFU also improves the overall skin tone, pores, brightness, and elasticity. It boosts new collagen production and collagen regeneration right at the source. If you want to avoid the frozen look of botox and cosmetic surgery, you can opt for this non-surgical skin rejuvenation treatment for maximum impact instead. 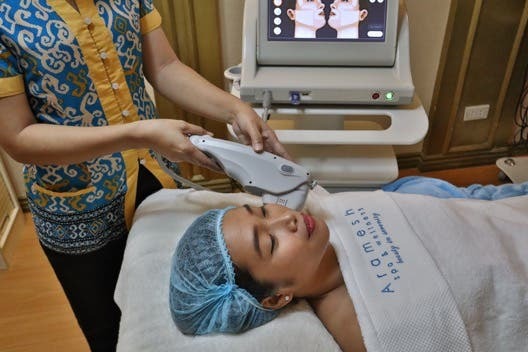 With opportunities to treat stretchmarks, acne scars, UV damage and more; this non-surgical skin treatment can drastically reduce wrinkles and lines by tightening the skin and rejuvenating its natural elasticity. Most of the time, your skin will start to show the signs of aging when you reach your 30s. This is the time when the skin will naturally lose its elasticity and firmness. However, while it is true that your age can be a good guide to when you should consider HIFU treatment, you should keep in mind that everyone’s skin ages differently. Some of us might need help earlier on, while others might not need the treatment until later. It is therefore important to consider the condition of your skin and whether it will benefit from the treatment. Visit Aramesh Wellness and inquire about this treatment now.